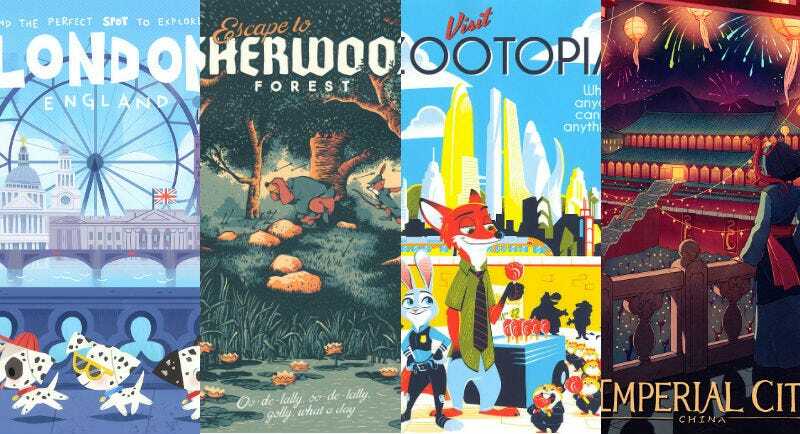 Posters from 101 Dalmatians, Robin Hood, Zootopia, and Mulan from a new art show. That’s where “Dream Destinations” comes in. It’s a new exhibit of Disney travel posters presented by Gallery Nucleus and Cyclops Print Works. Artists from all over captured their favorite Disney locations in stunning visual styles, and here are just a few of our favorites. To see the exhibit in person, head to Gallery Nucleus in Alhambra, CA between now and August 18. The whole exhibit is also online at this link. Some of the pieces are available as prints, too, and you can snag them at this link and this one.